Has your computer been running slower than it used to? Are you constantly faced with annoying pop-ups, error messages or system crashes (blue screens)? These can be symptoms of malware (malicious software) on your system. Even the most vigilant user can unwittingly end up with a virus or other malware on their system. When that happens we are here to help! Malware/Viruses can affect your PC, laptop or other device in many ways. Some of which have a dramatic effect on your systems performance or can even “lock” your computer entirely. Others can run quietly in the background surreptitiously stealing your data, without even having a perceptible effect on your system's performance (this is especially be the case on a high end device with more resources to absorb the malware's negative impact on performance). 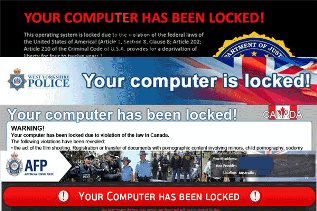 If you are concerned that your system may have been infected contact us for assistance. We will not only thoroughly remove any virus and have your system running smoothly again, but we'll also help to educate you on ways to avoid any future virus/malware infections to help keep your data and system safe. Click here for our article on how to avoid your system becoming infected in the first place or here for our “Free Download” section and our favourite free antivirus programs. We personally recommend AVG Free 2015.